How to update object in vuex store array? I'm asking for help with a problem implying an array sorting in the following manner: all even numbers must be in front of the odd ones. I've partially made the problem, but I did the sorting in the opposite manner and I can not manage to fix it. 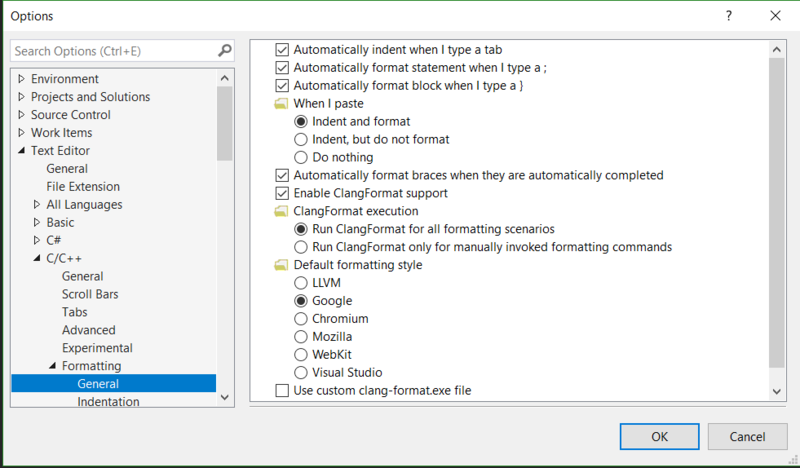 Visual Studio has native integration for clang-format since 15.7 prev1. I'm using 15.9.9 and nicely see the configuration in the options. From my understanding, as 'Google' is selected in the formatting style, it should use either my .clang-format file which is in the root of my checkout or fallback to the hard-coded configuration with name 'Google'. However, if I format my file: Ctrl+K, Ctrl+D, my file gets formatted using Whitesmiths; which is the brace configuration of my Visual Studio formatting. Did I forget to configure something that allows me to use clang-format or is something horribly going wrong? If it is the last one, I appreciate some debugging tips. I've managed to get my game to read in a PNG file, and successfully texture my objects. To be honest, I can't 100% nail down how it's actually working - and now I'd like to extend it to loading several textures, and using the one I specify. However this doesn't apply any texture whatsoever. If anyone has any ideas, I'd really appreciate the help. Thanks! I have a project for the university with three classes and I have a little problem. The program I wrote works, but they told me I have to use algorhitms somewhere and not only for cycles for the maps and vectors, so I can receive a better mark. For example, I should find how many tourists are over n(parameter) years old in the complex. I have class Tourist(name, age), class Hotel(name, beds, stars, map) and class Complex(name and vector). I tried to make a function in Hotel, which calculates how many tourists are over n years old and then I called he function in a for cycle in Complex for all the hotels in the complex. So, that worked. But when I tried to replace that cycle with countif... Error. I apply some code. I'm pretty new to vue/vuex/vuetify but starting to get the hang of it. I have a problem though I haven't been able to solve properly. I have an array of "projects" in my store. When deleting and adding items to the store via mutations the changes reflect properly in subcomponents referencing the array as a property. However, changes to items in the array does not reflect even though I can see that the array in the store is updated. But the problem with the above two methods is that the order of the array gets changed and I would really like to avoid that.. So basically, how would I rewrite my mutation method below to make the state reflect to subcomponents and keep the order of the array? I have an 2D array which i want to use as a grid. I want use this 2D array to plot a quiver plot. I know how to merge two sorted lists in Haskell, however, I have no idea how to merge three sorted lists. I wrote some code, what should I do next? I am trying to create dropable zone to add images to my application. I also want those images, once added, to be sortable by dragging them and reordering them in grid type of zone. I have implemented react-dropzone-component which is great. The problem now is to be able to select the images added into the dropzone and drag them to reorder them as desired. There are some great components called react-sortable-hoc or react-reorder but I can't integrate it since this component needs to have access to any single image added during. I only have access to the higher Dropzone component but not its children.